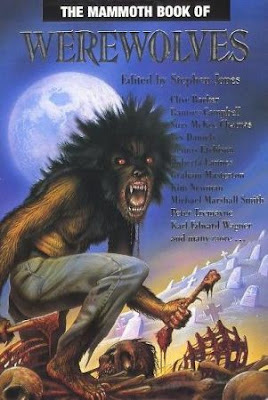 I came across this reprint of The Mammoth Book of Wolf Men: The Ultimate Werewolf Anthology and had to show the terrific cover. The contributing authors seem more from the horror genre but I thought it might be of associational interest to werewolf lovers. Also below is the original cover (1994) for comparison - what do you think? Releasing Oct 12, 2009. 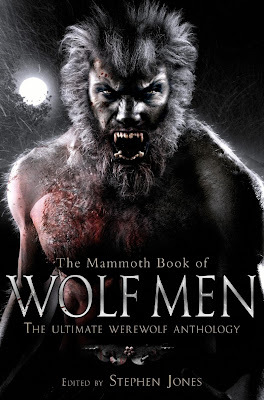 This collection of 23 dark stories of the supernatural creature, half-man, half-wolf, and entirely unpredictable, is being re-released to coincide with the much-anticipated Wolf Man, starring Anthony Hopkins and Benicio del Toro. 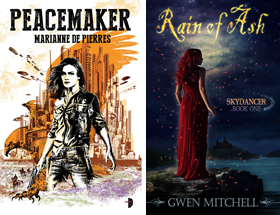 Top contributors include Clive Barker, Michael Marshall Smith, Graham Masterton, and Mark Morris. Twenty three tales of terror and transformation, of the beast that lurks within. Here is the original 1994 cover for the British edition and the content listing. Oh no Tez it is totally over the top. Very graphic novelish the older cover and the new one is prototypical Hollywood werewolf. Awesome image though. The new one may be protoypical, but its still awesome. I'm lovin' the new cover. I do have to admit, I do like the bloody meaty bone in the older one. That's stereotypical, don't you think? Jackie they both have their pluses. If this was truly UF I don't think the earlier cover would work today but for horror - maybe.